On a roll with my Christmas cooking now and yesterday picked the first of the organic figs (ie growing on the tree in the back yard) which looked very pale inside and I thought I would have to add some food colouring to perk it up (god forbid). Then miraculously the natural colour became richer and richer in the cooking- I couldn't believe it! This looks like a berry jam instead of fig it is so red all on its own! I will package these two little beauties up to give away as gifts. This preserve is not only good on toast but great with cheese instead of quince and a nice alternative to have with the turkey instead of cranberries. Click here for the recipe that I made in February this year. Merry Christmas. Thanks Charlie, had the jam this morning on toast (couldn't resist) and it was good even if I do say so myself. Have a great Christmas. How gorgeous, I'm guarding the two jars I have left for cheese courses in France. Have a Wonderful Christmas and Happy New Year. Good idea Jude, but it must be very tempting to keep them safe that long. Christmas wishes to you and your family. Its funny what we take for granted - this fig tree has been in my back garden for about 50 years (planted well before we moved in) we are just reaping the benefits. Have a wonderful Christmas see you again I hope on the blog in 2013. 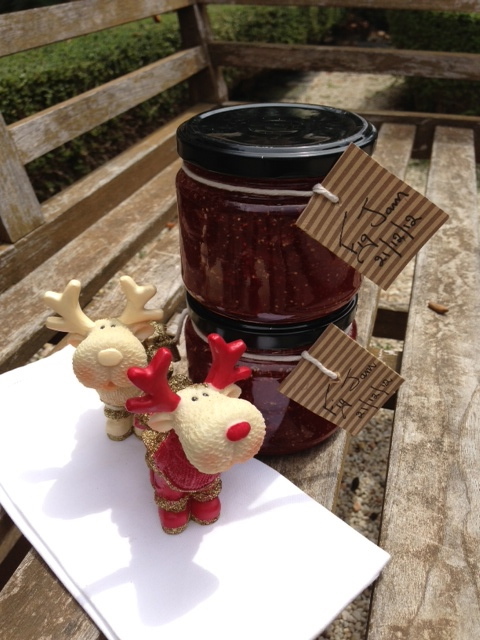 Must try making fig jam next year - will probably have to buy them though - we only had one fig on our tree this year and the birds got that! I know you have to be so vigilant - the recipe makes 4 nice pots.